Chances are that one day each of us will find ourselves in the difficult role of caregiver to a loved one as they face their final years. If the order of things is kind, it will be a grandparent or parent at the end of a rich and full life and we will have the help of a supportive community. But with 10,000 Americans turning 65 every day, the gray wave sweeping across America has left many elderly facing old age in insolation. The reality is that modern medicine means that more of us will live longer — many with chronic illness. Sadly the community support systems that used to aid us in caring for our elders — both family and institutional — are becoming less accessible. Thus the role of caregiver can now present itself in the most unexpected of times without the logistical and emotional support we need. I came to see the dramatic challenges elder Americans and their caregivers are facing in painful detail while making my most recent documentary Left on Purpose. What started out as a film exploring the life of my friend Mayer Vishner, a lifelong anti-war activist and a true Greenwich Village character, took a dark turn when I realized how desperately alone and depressed he was. Before long I became the primary caregiver to my film subject. Filming Mayer Vishner for the documentary Left on Purpose. Mayer was an original member of the notorious Yippies, the 1960s activists who perfected the use of satire and sarcasm as tool of political dissent. His youth had been filled with an optimism that the fundamental political change he was fighting for was not just possible, but was imminent. Within a few months I began to see that the once engaged activist was actually battling isolation, depression and substance abuse. Through the process of filming Left on Purpose, Mayer and I became very close and the film shifted to become an intimate portrait of a relationship between a filmmaker and a subject. As he became part of my extended family, I began to face the challenges of being a caregiver. I looked for ways to re-engage him with the world, but it was a struggle beyond my power to succeed. Sadly he took his life. It was through this experience as friend and filmmaker, I realized that our healthcare system and our society are not prepared to support our growing elder population as they deal with these challenges in their later years. Alarmingly, the Trump administration’s recently proposed budget will have a devastating effect on the social safety net and support systems for many of America’s most vulnerable — particularly the nation’s elderly. The cuts include billions of dollars slashed from programs intended to help elder Americans such as the Senior Community Service Employment Program, Meals on Wheels, the Low-Income Home Energy Assistance Program, caregiver support, respite care, elder abuse prevention and supportive housing for low-income seniors. Thus, it is through my 6 year friendship with Mayer that the Left on Purpose team was inspired to create a tool to help older Americans, their loved ones and caregivers to prepare for a healthy and fulfilling life as senior citizens. With the support of The Sundance Documentary Fund and AARP of New York we created the Elder Health Tree. 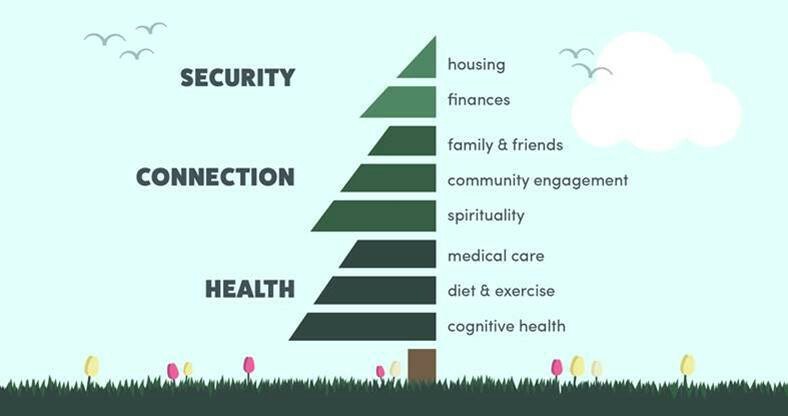 Based on the model of the food pyramid that we all grew up with — this seeks to visualize in one place, the different aspects of life that elder Americans need to consider when looking to have a well balanced later life. So, rather than just thinking of physical health and economic stability, the Elder Heath Tree also emphasizes the importance of community engagement and spiritual wellness. Those social and emotional components that are so often overlooked. Through an easy to navigate website, The Health Tree provides seniors and their caregivers clear bullet point suggestions as well as links to further resources. We hope it will become a valuable tool for individuals to advocate and plan on behalf of themselves and their loved ones for a happy, healthy life through their elder years. Justin Schein is a documentary filmmaker and co-founder of Shadowbox Films. He lives in Brooklyn NY. The award winning documentary Left on Purpose is available on iTunes, Amazon and Vimeo.